Baslow is an ancient village in North Derbyshire about 3 miles east of Bakewell, appearing in Doomsday Book as Basselawe. The Manners family, later the Dukes of Rutland, became Lords of the Manor in 1565. Until the mid 1800s it was a Chapelry of the Parish of Bakewell and included the hamlets of Bubnell, Curbar and Froggatt. Most of the village of Baslow is on the east bank of the river Derwent, while the hamlet Bubnell is on the west, north of the bridge. The land in the valley bottom is reasonable for arable and pasture. To the east the ground rises steeply to the rocky "Edges" and the extensive moorland beyond. Bubnell had a share of this moorland. All land in the valley, and some on the edges and on the open moorland had been enclosed before the nineteenth century. There had been Millstone production, Lead Smelting and Coal Mining on the Edges, but all three were of little significance by the 1820s, though some Quarrying continued. In 1841 the population was 962 in Baslow and 128 in Bubnell. Baslow had always been important for its bridge and relatively easy route over the hills to Chesterfield and the North Sea Ports. The first Turnpike was built in 1759 from Wardlow to Chesterfield passing through Little Longstone, Hassop and Baslow, up through "The Park" to Robin Hood and on to Old Brampton. An alternative route included Stoney Middleton, Curbar Gap and Clod Hall. Baslow was well provided with Shops, Inns, Mills and a wide range of Craftsmen, and would have provided services to other villages, including Bubnell which had none of the above. The Duke of Rutland as Lord of the Manor owned most of Baslow and all of Bubnell. Freehold land accounted for perhaps 6% of the total in Baslow, much of which originally came from an estate at Nether End belonging to the Eyre family of Hassop. Chatsworth House and Park, belonging to the Duke of Devonshire, lie immediately to the south of the village. Before the exchange of Lands, the Park extended to the Baslow Parish Boundary which is approximately halfway between the House and Baslow village. Three events affected Baslow in Derbyshire between 1822 and 1826. They were The Enclosure Act of 1824, the Construction of a new Turnpike road to Robin Hood and Chesterfield, and the Exchange of Lands of 1823 between the Dukes of Rutland and Devonshire. The Enclosure Act abolished various Rights and Taxes, and led to alterations in land ownership though no land was enclosed. The New Road gave better communications to the East. The Exchange allowed the Duke of Devonshire to extend his Park to the North with a new approach road running through it. The planning and execution of each were spread over the same few years. This paper described these events, with Appendices giving details of individual villagers and their property. Curbar and Froggatt are not included in the article. The objective of Enclosure Acts was twofold. The first (irrelevant in Baslow) was to enclose the common agricultural land so the farmers could be more productive. The second was to abolish various Rights and simplify administration. The owners of the Rights were recompensed by portions of the Common and Waste Lands which then became the personal property of individuals. The Right of Access to these lands had been an important asset to villagers being used for grazing, the collection of wood and peat etc. The Act was implemented in three stages. First all eligible persons were allocated "allotments on the Moor". Next all these Allotments were exchanged for assets elsewhere. Finally some land ownership was reorganise for the convenience of the Dukes. The value of all the Rights listed was calculated, and the Common & Waste Lands were divided up in proportion to their value. Most recipients got a neat rectangle of barren moor off the Turnpike from Curbar to Chesterfield. The Duke, much the largest Landowner in the village, received the biggest allocation, which included all of Big Moor and Gibbet Moors. Details of the Rights involved and the area of land allocated in exchange are listed in the Table 1. Chief Rent is defined as "A payment made on freehold Land to the original freeholder". This had been paid for generations by a number of villagers to the Duke of Rutland. It was abolished by the Award, with the Duke accepting Allotments on the Moor in compensation. The rent could not have been large as the area allocated amounted in total to only 2 acres. Small Tithes had been paid to the Vicar of Bakewell by the Duke of Rutland, who was reimbursed by the Tenants as part of their rent. In return for abolishing them, The Vicar received two Allotments, one each for Baslow and Bubnell. We do not know if the rents were reduced - probably not! The Surveyors of the Highways got one acre for each village "for the getting of stone"
As Lord of the Manor the Duke of Rutland got 82 acres for Baslow and 85 acres for Bubnell. For Common Right. All freeholders were entitled their share of the Common and Waste Ground in proportion to the value of their holdings. In Baslow the freeholders got 79 acres while the Duke got 1271 acres. It can be deduced that that the freeholders owned about 6% of the value of the village. The list of freeholders, the size of their allotments and the amount of Chief rent give an insight into the social structure of the village. This discussed later in the article. There were no freeholders in Bubnell, so the Duke was allocated all the remaining Common and Waste Lands. These allotments on the moor were never intended to be enclosed or occupied. Each was exchanged for Rutland property elsewhere, mainly in Baslow, leaving the Duke as sole owner of all the Common and Waste Lands outside the village. The Schedule to the Act of Parliament gives full detail. The Vicar of Bakewell got property in Bakewell. The Surveyors of Highways would no doubt have got some other facility for getting stone. Baslow freeholders got land within the village conveniently close to their current property, with the few exceptions noted below. The Curate got an extension to his "Glebe" - a larger garden. No exchange was mentioned for the Society of Methodists' Allotment. Is it chance that the Methodists leased land for their new Schoolroom in School Lane in 1822? 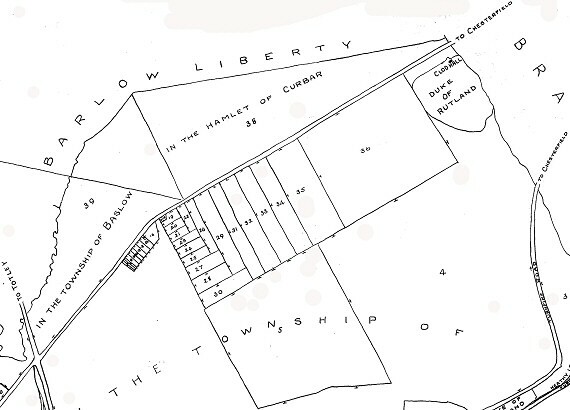 Thomas Gardom and William Kitchen got land outside Baslow. The only Allotment on the moor not accounted for in the Act belonged to The Duke of Devonshire. However the transaction did appear in the financial accounts for the subsequent Exchange of Lands, proof of the interconnection between the Enclosure Award and the Exchange of Lands. The diagonal road is the 1759 Turnpike between Curbar and Chesterfield, with the Baslow to Owler Bar and Totley road crossing it at the bottom left. Allotments to freeholders were within the subdivided rectangle south of the road. The Duke of Rutland took advantage of the Act to reorganise his property in the Parish, partly to consolidate his ownership of all land outside the village itself, and partly to prepare for "The Exchange of Lands" with the Duke of Devonshire. Freeholders with land in the future Park were given plots nearby - to be subsequently purchased by the Duke of Devonshire. Thomas Gardom, who lived at Cliff House between Baslow and Curbar, exchanged his fields off the Bakewell Road (and his allotment on the moor) for Rutland land adjoining his house in Curbar. Nicholas Broomhead exchanged moorland near Cupola for building land in the village. Neither of the last two were relevant to the Enclosure, but both were listed in the Act of Parliament. Before the Turnpike era, travellers leaving Baslow towards the south and east would have used a route across the Bar Brook at Nether End, through “The Park” and up the deep hollow way then known as Coal Pit Lane to Dobb Edge and Parkgate Farm, and on to Holymoorside or Ashover. According to J B Ward, the route was known as the “Halifax Gate”, and Parkgate Farm was “The Horns Inn”. The first Turnpike connecting Baslow to Chesterfield, built in 1759, passed up through The Park, crossed the Heathy Lea Brook just before reaching Robin Hood and continuing to Wigley and Old Brampton. The eastern part of the Turnpike over the moors - the old road - must have become inadequate for the traffic which would have included heavy industrial goods. In 1812 a diversion was built starting from the bridge below the Robin Hood. It continued for a kilometre on the south bank of the Heathy Lea Brook, often at stream level, up the narrow steep sided valley until it reached open moorland at the junction of the Umberly and Blackleach Brooks. It then followed a new route (the present A619), across the moors to Wadshelf and Chesterfield. The narrow section must have been difficult, especially in times of flood so an alternative route would have been welcome. Also lower part of the Turnpike near the village crossed land which the Duke of Devonshire was planning to include in his new Park extension. This would not have suited the Duke. The solution was simple, and The Dukes would have had no difficulty in arranging for their Turnpike Trust to build another diversion, this time from The Wheatsheaf Inn in Baslow, north of the Heathy Lea Brook, through Robin Hood and on the join the 1812 road at the start of the open moorland. The Toll Bar was at Robin Hood, now the triangle of grass opposite the Inn where the Old and New roads to Chesterfield diverge. The section of the new road in Baslow Parish then became the new boundary between the Rutland and Devonshire Estates. The photograph shows the route of the Turnpike up Heathy Lea Brook between 1812 and 1824. The road is next to the stream. William Spencer Cavendish became the 6th Duke of Devonshire In 1811. The next three decades saw major changes both in the Gardens and the Park. At Edensor, houses and roads were moved and the Park extended, achieving among other objectives a much better approach to the house from the west. The north end of the Park remained a challenge. Though a minor road connected the House to the Turnpike, this did not provide the gracious entrance that the Duke desired. In his early years, some improvements were made, but the breakthrough came around 1820 when the Dukes of Devonshire and Rutland decided to exchange several estates in North Derbyshire. In all the Duke of Devonshire acquired 3366 acres, including 1002 acres in Baslow, 1273 acres in Hathersage and 409 acres in Aldwark. Unfortunately there are no records of the land acquired by the Duke of Rutland. It is perhaps relevant that his temporary sporting Headquarters were in Baslow at the time, and that he built his new Hunting Lodge at Longshaw a few years later. the existing Baslow Chatsworth Parish Boundary to the east. The exchanged land can be divided into three sections. “It may not be improper to remark that there are several Freeholds within this district, which will probably be a lasting inconvenience, as they cannot be obtained by purchase or Exchange, but on the most disadvantageous terms”. The middle section, which remained as farmland, occupied the shelf above Dobb Edge between Robin Hood and Park Gate Farm but included a few fields below the Edge near Robin Hood. This area was still being farmed by the same tenants 20 years later. The area had previously been mined for Coal, but as this is not mentioned in the documents and it is likely that mining had ceased before 1824. The third and largest section was Gibbet Moor, 652 acres of open moorland east of the original Chatsworth estate. The Duke of Rutland had only just acquired full ownership with the passing of the 1824 Enclosure Act, and thus the right to sell it. It is interesting to note that the Exchange of Lands is dated 1823. The Duke's first task was to buy this freehold land. It must had been negotiated well before the exchange, as the Enclosure Award had ensured that all the property was in convenient parcels ready for sale. There is no record of any objections by the owners. The next task was to clear “The Park” of tenants. There were seven tenant farmers with 9 to 72 acres. They included Park Lane Farm, Heathy Lea House, Heathy Lea Corn Mill and two farmhouses near the Turnpike. Two farmers lived in Baslow village. Later none of them could be traced in the Baslow 1841 census or the 1848 Tithe Award, so they all must have left the area. Chatsworth Estate records locate three of them 20 years later as Devonshire tenants in Dore and Edensor. The others may have been accommodated on Estates further afield or helped in other ways. There were eight dwelling houses without land. Six were situated near the Bar Brook on land that remained outside Park so the tenants were not affected One tenant moved into its own freehold property in Nether End, and the last, who had relatives in Baslow, probably moved into the village. A number of Baslow residents had a few acres in the park. They all had further land or occupation, so the loss would not have been disastrous. A list of all the tenants in the land acquired by the Duke of Devonshire appears in Appendix A below. Once the Land had been cleared of people and the turnpike road diverted, the Duke of Devonshire had the major task of landscaping his Park. Obviously this took many years. All buildings and field walls were meticulously removed, though some of the hedgerow trees were left to become the mature specimens still standing today. New plantations were made to extend the “Capability Brown” type landscapes, hiding Baslow and the new road in the process. The Drive was moved to its present route, and the new Grand Entrance constructed, complete with approach, Lodges and Golden Gates. 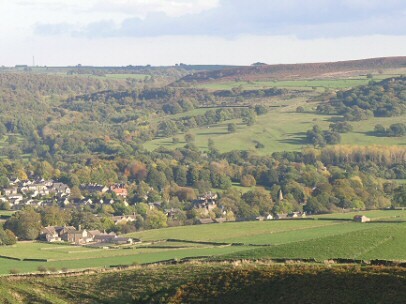 The Photograph shows Bubnell and Baslow villages in the foreground. The land which became the extension to Chatsworth Park is below the lower scarp in the upper right quadrant. The rest of the Exchanged Land is at the top and extends to the horizon on the right and beyond. The modern A619 road runs through the trees to the left of the picture to Robin Hood which is hidden from view. The 1759 Turnpike went straight up the middle of the Park and can just be discerned. Most Baslow and Bubnell villagers lost their Rights to Common and Waste Lands. Tenant farmers from the new Park were evicted: some may have been resettled elsewhere. Derbyshire got a better road between Baslow and Chesterfield. Baslow Villagers were relieved of paying Small Tithes and Chief Rent. Baslow freeholders gained property in the Village or nearby. The Duke of Rutland got complete control of the Baslow moor lands, and with minimal exceptions became the sole owner of all agricultural land outside Baslow village itself. The Duke of Devonshire was the main Winner. He got a large private Grouse Moor within walking distance of his home. He got a big extension to his already outstanding Park. And he got an imposing new northern entrance to Chatsworth House through his new Golden Gates. Personally I think the last is the main reason why the Enclosure Act was passed, the Chesterfield Road was diverted and the Dukes Exchanged Lands. 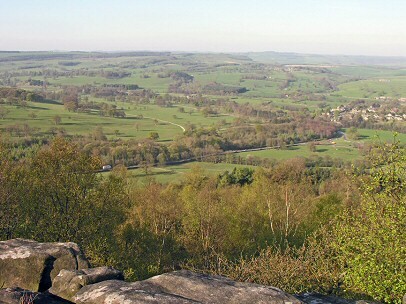 A view of Baslow and Chatsworth from Gardoms Edge near Robin Hood. The 1824 Turnpike is across the centre with the shelter belt and the New Park behind it. Baslow is on the right. Chatsworth house is just out of sight in the upper left corner. Tenants of land acquired by the Duke of Devonshire from the Duke of Rutland. In 1823 The Duke of Devonshire exchanged lands with the Duke of Rutland, and acquired the part of Baslow west of the Bar Brook and south of the Baslow to Chesterfield Road (the A619). Apart from Gibbet Moor, the land was occupied by tenant Farmers. In order to extend his park some of the tenants had to be moved. The Table below lists all the Tenants, and their fate after the park was extended. Tenants of Houses in the Park with under 1 acre of land. Tenants with over 9 acres. Tenants with less than 3 acres noted for the record. The Duke of Rutland had been the Lord of the Manor of Baslow for generations. This account describes the freehold land and freeholders in Baslow village only. The associated hamlet of Bubnell was owned entirely by the Duke and is not considered further. I have identified all the freeholders and the locations of their lands before the Enclosure Act of 1824, and the changes effected by the Act. Information is from Enclosure Act of 1824, the Baslow Census of 1841, the Tithe Award of 1848, and documents about Eyre property kindly provided by the Chatsworth Archive Department. The Table lists the freeholders in the village who qualified for “Allotments on the Moor” together with the size of their allotments. It also includes the Chief Rent paid by them. The size of each gives an indication of their relative importance. 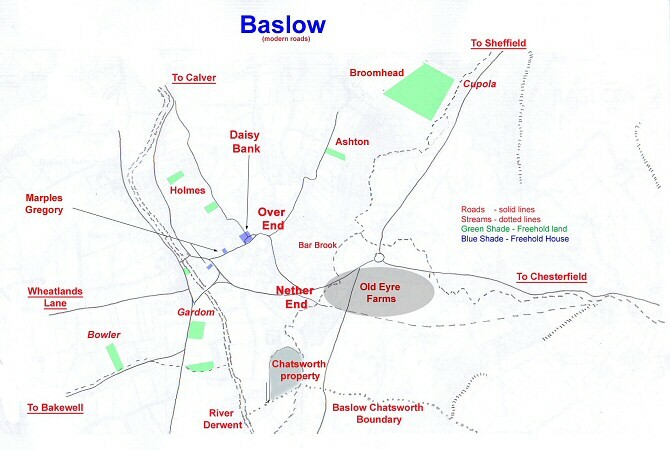 The schedules and maps with the Enclosure Act and information from Chatsworth give the location of the freehold property which is summarised in the Map of Baslow below. Most was at Nether End and around Daisy Bank, with more off Bakewell Road and in the south of the village. The largest area of freehold in the village can be traced back to Rowland Eyre of Hassop. 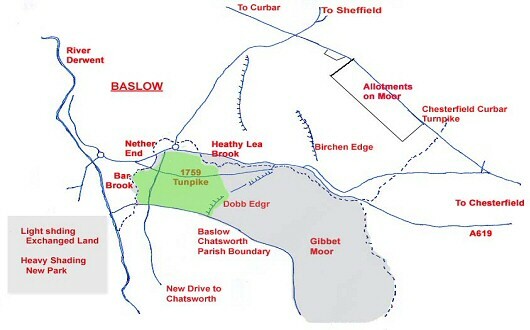 Records at Chatsworth confirm that he sold two farms in Baslow in 1701. Most of the land was at the north end of “The Park”, in the vicinity of the Golden Gates. The first Farm, of 20 acres and known at the time as “Marples Farm”, was sold to John Jackson for £190. The main part, a Homestead and 13 acres east of Bar Brook at Nether End was subsequently bought by the Marples family, who retained it until 1826. The original farm included a few fields off the Baslow Bakewell Turnpike near Rymas Brook (perhaps the relics of an ancient Field System). The latter were sold to Robert Holmes, who sold them on to Nicholas Broomhead for £170 in 1790: finally Sampson Bowler bought 2 acres - some if not all of the area - in 1791. The second Farm was sold to William Johnson. The Homestead was on the Bar Brook just south of the Turnpike Road to Chesterfield, with 10 acres to north of it. It included the triangular area at Nether End between Goose Green, the Bar Brook and the old Turnpike road, with two fields south of Nether End (3 acres). In 1787 the Johnson family were in debt and had to sell part of the farm to William Kitchen, retaining the Homestead, 4 acres east of Bar Brook and the north part of the area at Goose Green (opposite the Wheatsheaf Inn). Later Johnson sold his farmhouse to the Duke of Rutland and retired to a new house (now Bar Brook House) built on his property at Goose Green. Meanwhile William Kitchen had the residue of Johnson's fields, and the southern part of the Goose Green site which he developed into a Malthouse, Brewery and “The Barrel” Inn. The Tithe Award shows a second group of freehold properties located in a small rectangle either side of Daisy Bank, covering about ¼ acre. The Houses included Moorstones, Hanover Buildings, Raleigh Cottage, Sycamore Cottage (on School Lane) and the (old) Methodist Chapel. John Lees, a resident of Bakewell who owned Moorstones, also had 2 large fields to the east and north of the house. It is tempting to guess that the whole area was (part of) some earlier freehold Farm or Estate. Robert Holmes had 2 separate fields north of the village, Valentine Ashton had a field up Bar Road and William Bowler owned 2 fields on Rymas Brook as mentioned above. Nicholas Broomhead had 6 acres of rough hillside up the Sheffield Road near Cupola. 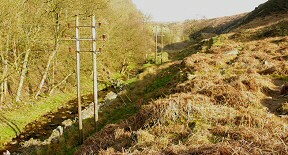 The Trustees of Thomas Gardom of Cliff House near Curbar (he died in 1817) had three fields on the west bank of the Derwent. Finally there were two freehold houses. One was the present Prince of Wales Inn (now Rowley's) which was a Carpenter's shop and house belonging to the Gregory family. The other was Magnolia Cottage in School Lane, owned by John Marples a Millwright. All the property east of Bar brook, and two fields south of Nether End, were bought by the Duke of Devonshire, that is all the original Eyre estate except the plot at Goose Green. The Duke of Rutland acquired all the fields west of the Derwent and the fields up the Bar Road & the Sheffield Road, leaving only one landowner in the village, John Holmes with two fields near Over End. There was no change in ownership of the freehold houses, with each benefiting in some way from the Act. Nicholas Broomhead, the Publican at The Peacock Inn (now the Cavendish Hotel), deserves special mention. He was wealthy, as he could lend £1000 to William Kitchen and like John Holmes could afford to take part in property deals. He had also owned 6 acres of rocky pasture off the Sheffield Road, the only Moorland property in private hands. It was immediately next to the Cupola, a Lead Smelting Facility. It is interesting that an ancestor John Broomhead was Smelter to the Duke of Rutland in 1679. In the Enclosure Award he did well by getting a valuable acre of Land opposite the Church in exchange for his 6 acre pasture and his allotment on the moor. On this acre, he built a large House for himself (Baslow House) and the block terraced houses on Church Terrace and School Lane. Perhaps repayment of the £1000 owed him by William Kitchen provided the finance for the development. As a note of interest, it is possible that this acre contained the temporary Hunting headquarters of the Duke of Rutland which is mentioned in the Exchange of Lands Documents. William Kitchen was an entrepreneur with several interests. His family had been tenants of Bramley farm since before the Civil War. In the late 1700s he had a share in the Mill at Calver and owned land in Barlow. In 1776 he was owed money by William Johnson who could not repay. Kitchen acquired some of his land at Nether End including the southern half of the plot at Goose Green on which he built a Malthouse, a Brewery and an Inn, The Barrel. Later he too had financial problems, perhaps because of the fire which burned down Calver Mill in 1801. He had to mortgage his land in Baslow and elsewhere. In 1810 he re-mortgaged, borrowing £1000 from Nicholas Broomhead, an enormous sum in those days. The debt was partly paid off when he sold the Johnson fields to the Duke of Devonshire, and the Goose Green property to local developers. The latter included the White family who rebuilt the Inn as The Devonshire Arms in 1861. The Gardoms were another long established Baslow family based at Far End (Yeld Farm) and associated with the place name Gardoms Edge. A branch of the family moved to Bubnell Hall, where they prospered and bought Cliff House, the residence of Thomas Gardom before the Enclosure Act. He died in 1817, and the transactions were in the name of his trustees. In exchange for three fields amounting to 6 acres in Baslow west of the Derwent, he was awarded a group of fields around his house creating a small estate, which was later to become Cliff College. Robert Holmes was the tenant farmer at Cherry Tree Farm (behind the Village Shop) He too must have had wealth, as he is known to have been involved in buying and selling fields near Rymas Brook. The origin of the two fields he owned north of Over End is not known. Joshua Gregory a Carpenter, bought the buildings at the present Prince of Wales in 1741. In his will he left it to his three children. One carried on the business. The eldest, who inherited the section nearest the road, emigrated to London to establish a carpenters business in the capital. His daughter Ann Dawkins owned the property in 1824 at the time of the Enclosure Award. She got a small plot north of the building, which eventually became the village mortuary, a building still remembered by older village residents. The Marples were an influential village family. George Marples had the farm at Nether End which was bought by the Duke of Devonshire in 1826 for his Park. His cousin John Marples, a Millwright who owned Magnolia Cottage, was awarded land between his house and the Methodist School Room, which became his family's residence and work yard. Other independent members of this extended family included the Blacksmith, a Saddler, a Butcher, a Tailor, a Shoemaker and earlier a Publican. 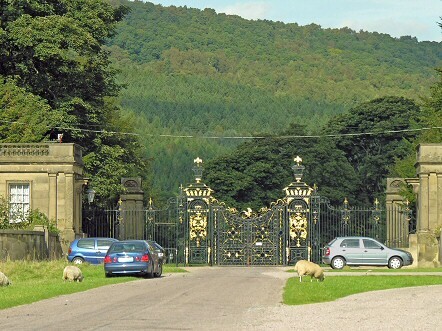 The Duke of Devonshire had always owned a few acres in Baslow west of Barbrook and adjoining Chatsworth Parish. Daisy Bank is the short lane behind the Old Chapel. after Six acres near Cupola + a Malthouse in Park. after Property at Goose Green, and Land near Golden Gates. + after Land in The Park near Golden Gates. Most of the facts in this Study come from the Enclosure Awards of 1824, the Tithe Award of 1848 and the Census returns for 1841 and 1851. I am indebted to The Chatsworth archivists for further detail about the Land Exchange of 1823. Modern Names are in italics. The “The Park” refers to the part of the land acquired by the Duke of Devonshire in 1823 used for the extension to his park. The above information was contributed by David Dalrymple-Smith in October 2005, and May 2007. The account has also been published in the Bakewell Historical Society Journal in 2007.